1x or 2x, that is the question. Mountain bikers love to discuss gear. From tires to droppers, no topic is safe. If often leaves you the impression that cyclists prefer arguing about product over riding. One topic that is always up for endless debate is whether to 1x or 2x. With more options than ever, it’s a valid topic. 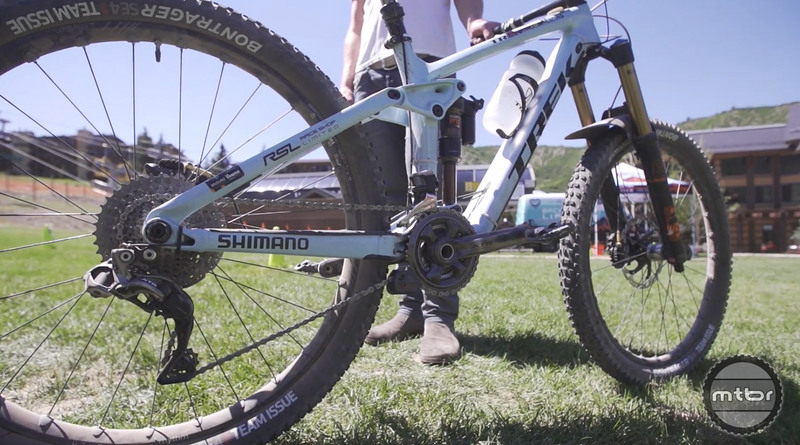 To gain a little real world insight into what the pros think, the Enduro World Series interviewed Rene Wildhaber (bike check here) and Katy Winton. Both riders are sponsored by the same frame and drivetrain manufacturer, yet have very different reasons for picking their drivetrains of choice. For Katy, a 2x drivetrain allows her to rest on liaisons stages. She also prefers the tighter jumps between gears and the wide range. One key feature with Katy’s drivetrain is although it’s a 2×11 system, she only uses one shifter. This is made possible by Shimano’s Di2 Syncroshift feature which shifts the front derailleur automatically. This allows the rider to focus the left side for the dropper post lever. Rene on the other hand, prefers 1x drivetrains for everything but super steep training rides. From his perspective, 1x setups are cleaner and tend to be mechanically safer come race day. To learn more about why these racers prefer their individual setups, press play. All well and good, but I’m afraid that Katy’s new Slash will leave her no choice but to go 1 x 12. My previous S-Works Epic had XX1 and now I have Di2 XTR so I had experiences with both. To me it depends where you ride, level of steepness, and elevation. Since I live in AZ desert area I loved XX1. The dependability, lighter weight, less parts were the main factors. Di2 2×10 is also great(including regular 2×10). It gives you more choices if you ride places that have steeper terrain and higher elevation(ex. CO). So if you’re a weight weenie and willing to sacrifice that to less choices of gears, go 1×11. Steeper terrain, more difficult trail rider, go 2×10. Why does no-one ever bring up “dirty finger shifting”?